Consensus is for further RBI easing. Neutral bias doesn't always mean a stable policy. Growth-inflation outlook isn’t that bad. Balance of risk is tipped toward easing. The RBI's Monetary Policy Committee conducts its bi-monthly policy review next week. The policy decision is expected around noon local time on Thursday, 4 April. As of this writing, there is no fresh consensus available for the upcoming meeting. In the last Bloomberg survey in late February, the majority of analysts forecast a 25 basis point cut in the second quarter of 2019, suggesting the central bank could cut rates either at the April or June policy meeting. However, under pressure from the government to ease, the central bank may well opt to move in April rather than June. At the last meeting in early February, the RBI shifted its policy stance from a 'calibrated tightening' to 'neutral'. Yet it also cut rates by 25 basis points, catching the markets- which had overwhelmingly expected no change- off guard. The only supportive factor for the last rate cut was the falling current rate of inflation (CPI). But inflation expectations were still high and remained supported by loose fiscal policy and a weak currency (INR) - which were strong arguments against a rate cut. The rupee's (INR) 1.9% depreciation in January was the worst in Asia. Subsequent economic data has shown that inflation, in fact, bottomed at 2.0% year-on-year in January. 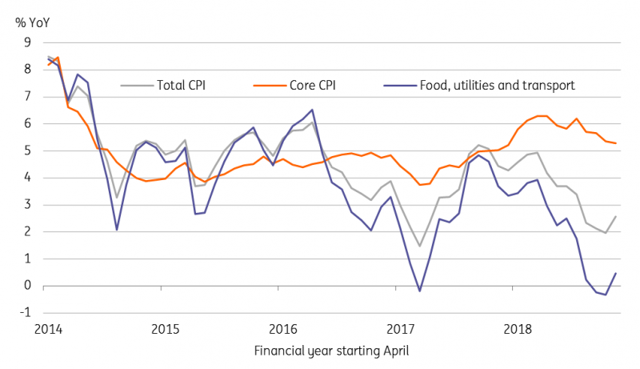 Its spike to 2.6% in February probably marked the beginning of an uptrend on the back of firmer food and fuel prices and an election-related boost to consumer spending. Meanwhile, GDP growth continued to grind lower. It slowed in line with our forecast to 6.6% in 3Q FY2019 (Oct-Dec 2018) from 7.1% in the previous quarter. Judging from a sustained slowdown in exports and manufacturing, it could dip further to about 6% in the current quarter. 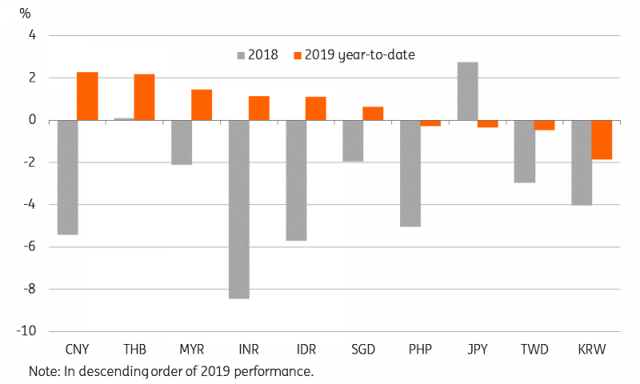 The INR gained some ground in February in line with its emerging market peers, which benefited from a dovish turn in Fed policy. In fact, the rupee was Asia's best performing currency in March despite all the prevailing woes - a lack of policy support, increased geopolitical tensions (border issues with Pakistan), domestic political risks before the general election and a persistent twin-deficit (trade and fiscal) problem. Adding to the negative outlook was the news of President Trump stripping India off the GSP preferential trade status, signalling a possible shift in the US trade battle from China to India. Prevailing market conditions reduce our confidence in the view that the RBI will leave monetary policy unchanged for the rest of this year. The RBI could use the ongoing INR strength to deliver a rate cut next week. However, we don't think the currency is completely out of woods just yet. Elections are just around the corner (voting takes place from 11 April to 19 May, results expected on 23 May) and investors might prefer to wait on the sidelines until this political uncertainty lifts. While the growth argument for RBI easing may have gained some ground, the inflation argument remains less persuasive. 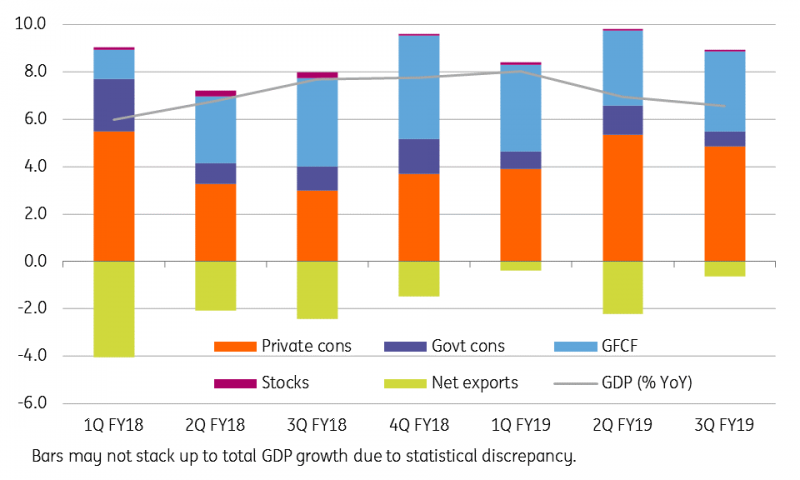 Although inflation may not be an issue through the first half of FY2020 (Apr-Sep 2019), staying in the lower half of the 2-6% RBI policy target, it's likely to be a problem thereafter, as the low base effect complicates demand-pull pressure from loose economic policies. Shouldn't the RBI stave off future inflation by keeping rates steady now? On the growth side, the RBI's forecast of 7.2% full-year FY2019 growth remains at downside risk while its 7.4% projection for FY2020 will likely be far off the mark. It will be difficult for the economy to perform well amid a global slowdown although it is currently benefiting from strong domestic demand. We think loose fiscal policy obviates the need for monetary accommodation. Political pressure from the government to ease remains intact, though we are sceptical that a monetary boost will really help the government to win an edge over its rivals in the coming elections. Despite all of these conflicting arguments, we think the balance of policy risks is tipped towards easing and another 25bp RBI rate cut looks to be a done deal for next week's meeting.